2300 STARTING WATT BLUETOOTH INVERTER GENERATOR is rated 4.8 out of 5 by 943. Rated 5 out of 5 by Rascal from Incredible Ryobi Power Maker I bought this generator For use with a small travel tailer. For eight days it performed flawlessly. Lite weight, very quiet and fuel efficient.The Bluetooth feature provided useful; information and it shut down with ease at quiet quiet time/ The Ryobi App on my Apple iPad Mini was perfect combination.I had a GenTent for weather protection, this combo made life so much easier. Currently it has 89 hours on its second oil change, which could not be much easier next oil change at 100 hours. USB port were a neat feature that really;y worked. The luggage like hands;e made moving a breeze. Needs a good dust cover, it likes being clean. Rated 5 out of 5 by MIKE IN NC from GREAT FEATURES I had an old small generator which was very loud and I wanted a quiet one. 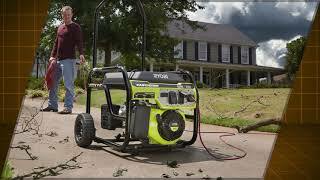 I reviewed all the small inverter type generators and decided on the Ryobi 2300. 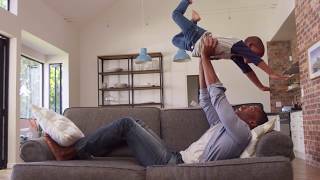 I bought Home Depot's extra 3 year warranty which gives me a total of 6 years of coverage. I was able to start and run the 13,500 BTU A/C unit on my camper with it. I like the handle system the unit has, especially the one that pull out and allows you to pull it easily. I have other Ryobi products that I have been satisfied with including gas weed eater with hedge trimmer and tiller attachments, 18 v One+ battery hedge trimmer, 18V ONE+ 6 pc Combo kit, 18v Orbital jig saw, etc. Rated 5 out of 5 by quitehappy from QUIET!! I bought this as a way to power a pitching machine for the kids when we take it to the park. After hearing it run, I also feel like we could take it to the campground and not bother any other campers. I was looking at the red brand, but after reading reviews online, comparing the 2 side by side on specs, and my love for Ryobi tools, I decided on this one and saved some money. The bluetooth was super easy to set up and the readings on the app are great. The readout on the front of the generator is very clear and gives you a lot of info - in real time. Highly recommend anyone looking at the other brand to compare the 2, and consider saving yourself some money. This one is just as good - if not better. Rated 5 out of 5 by Pilot Jim from Absolutely Faultless I purchased this generator a week before hurricane Irma struck our area in Florida. We were without power for a week and I ran this generator 24/7 for that time period without any problems. The only time the generator was off was to refuel and to change oil after initial breakin period. We powered our large refrigerator, my wife's oxygen concentrator (for COPD), two lights, two fans, and kept our smartphones charged. We also periodically operated a 42 inch flatscreen tv. The generator load around 30% and it ran 9-1/2 to ten hours on one tankfull. Great unit! Easy to empty gas from tank and carb for storage. Love bluetooth capability for monitoring performance using smartphone. Rated 5 out of 5 by jrsjim from AWESOME-RIFFIC!! Full POWER Generator...READ MORE! 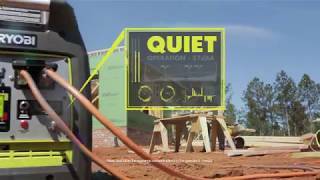 OK here's the deal...I was a home builder for about 20 years and wayyyy back had a Homewrecker generator, you know the cheap tecumseh engine, throw your arm out starting it generator. Then I moved up to a high-end Makita 6500 watt with a Robins engine...great generator, but not real portable. Since I am semi-retired from construction but still felt we needed a backup for power with seasonal storms, we looked at Honda and a few other brands...BUT then we found the RYOBI and I thought I was reading it wrong about the Bluetooth control, Well, I am a techy iPhone guy and was looking for an iGenerator for more iPower...iWOWZA!! Rated 4 out of 5 by Normal007 from Great: if it had 12v like 2200 would have 5 stars Less then 10 hrs on 2300, broke in with various loads. About 40 degrees Cold start, choke on slow pre pull, normal pull started every time. Tested on everything in house and garage.My 6.5 H.P. compressor I had to start with no air in tank (start load to high) then it filled tank to 150 lbs. no problem. Ran my Mig. welder on High setting. Larger Micro wave oven was worst, slow start but worked. Large frig-freezer slow start but worked. Only small problem is side service cover gasket is cheap garbage, tore first time opened, called about parts and gasket is part of side cover, and they replaced.So they are good on parts. Very quite, seems like a keeper. Rated 4 out of 5 by pitoxbox from Great little Inverter Generator I bought this little beast because I live in Puerto Rico and we were hit by to mayor Strom on Sept, 2017. I use this Generator every day since October 21 for the basic like fridge, fans, charge cell phonez laptops and table, led light, TV and laundry (Not all at the same time). The 1.2 gas tank last me most of the time 12 hours with the fridge (6.5 amp) 3 fans and 4 cellphone charger. I change the oil every 3 days because I use this almost 24 hours a day. I'm very happy with the product at the moment have more than 700+ hours of use. I didn't give the full 5 start because the handle vibrate and make a terrible sound. They need to improve this handle on future. But overall I recommended this generator. 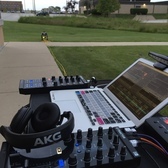 Rated 5 out of 5 by TmcnSC from Outstanding Performaceand Value I bought this generator about a month ago and I'm so glad I did. I followed the manufacturer's directions and it started on the second pull! First thing I noticed was how very quite it is. You can have a normal conversation with it running right beside you! I also like the automatic throttle that speeds up the engine when there is a demand for power. You may not power your whole house with this unit but if you want a quite generator that will keep your refrigerator or freezer cold when the power goes out or if you want something very portable for those camping trips or tailgate events, then this Ryobi unit is a great value and I highly recommend it! Visit the interactive landing page to learn more about this generator. 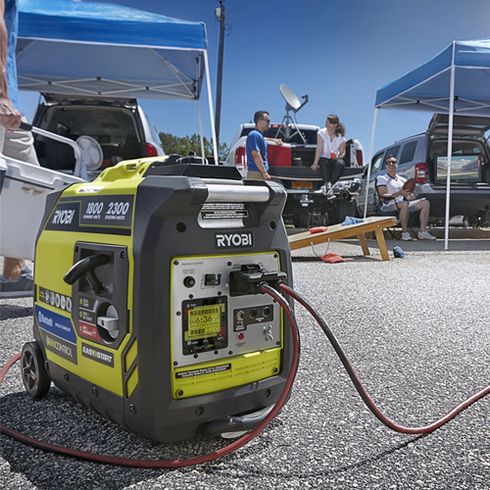 Whether you are tailgating, camping or on the jobsite, the RYOBI Bluetooth 2,300-Watt Inverter Generator is perfect for any occasion, offering clean, quiet power. With 2,300 Starting Watts and 1,800 Running Watts, this generator is whisper quiet and safe for most sensitive electronics. Conveniently monitor power consumption, fuel level, and run time remaining, as well as shut off your generator remotely with the GENControl app on your Apple or Android smart phone. This Inverter is equipped with Idle-Down Technology for increased fuel efficiency and rear wheels with an extending handle for easy transportation. 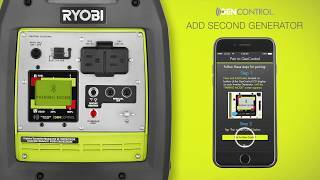 Parallel capabilities let you link together two RYOBI Inverter Generators for twice the strength to accommodate larger power demands. Backed by a 3-Year Manufacturer Warranty. Integrated Bluetooth Technology for the ultimate user experience. GenControl App and on-board LCD Screen monitor and display power consumption, fuel level and remaining run time. GenControl App reset button and on-board reset switch provide added convenience. Auto-Idle Technology provides greater fuel efficiency and extended run time (up to 10.3 hours at 25% load). Parallel Kit Capability for twice the power when a second generator is paired. Extended handles and rear wheels for easy transport. Clean power safely operates sensitive electronics through both 120V outlets and both USB outlets. Easy 3 step starting for reduced start up times. Quieter than a standard generator.